Another memory of visiting South Korea, wishing the sun will come back out in England. I went to the National Palace Museum of Korea and Chandeokgung Palace on this day. It's so magical to see historical buildings and learn about the history of South Korea. I'm a visual person and I love seeing artifacts therefore art galleries and museums are a must when I travel. 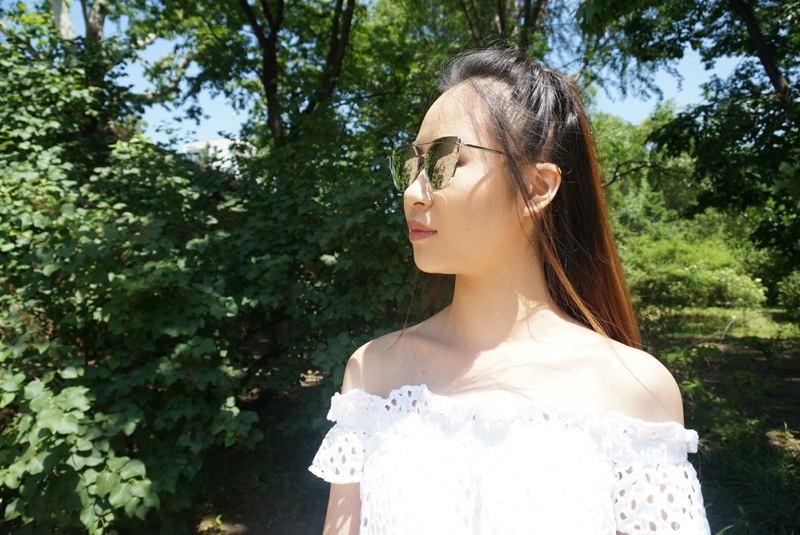 I wore a Zara Off Shoulder Top - it has an incredible laser cut detail which I have a soft spot for - it's all to do with the texture and the dimensional effect. Now you would be crazy not to absorb the amazing sunshine, therefore shorts were the one (my legs were tanned for once). I picked up some Primark Crochet Shorts from my last minute dash in the UK and I have been living in them in Hong Kong. The crochet trim and ripped detail gives it an edgy but dainty look. Accessories wise - I bought some sunglasses from a market stall in Dongdaemun - it's owned by a little granny who is soo cute near Lotte department store. They were 10,000 KRW which equals to £5 to £6 - how amazing are they? They have a pink mirror reflective lens and silver hardware and I love them soo much! Bag wise - I picked up a Mini White New Look Backpack - I always bring a backpack whenever I am travelling as it's easier to store my camera, a bottle of water and other things I class as essentials. My sandals are from River Island, I picked them up last December for this holiday and I have been wearing them to death. I get soo many compliments wearing these as they have a interesting diamante heel. That' all for this post and I hope you found some inspiration for your holiday/summer wardrobe. P.S I felt like Ariana Grande with my hair pulled back - I like it when my hair it out of my face.